In my last entry, I mentioned an upcoming group exhibition. More information is included on my “Events” page. The opening reception is on September the 18th and of course, the public is welcome (and I am looking forward to this). As a result, most of my time over the last week has been spent completing a few last pieces and preparing all of them for set up in the gallery. I’m continuing stitch work on two pieces, one is the ensō which I mentioned earlier, and another is a much smaller quilted piece. 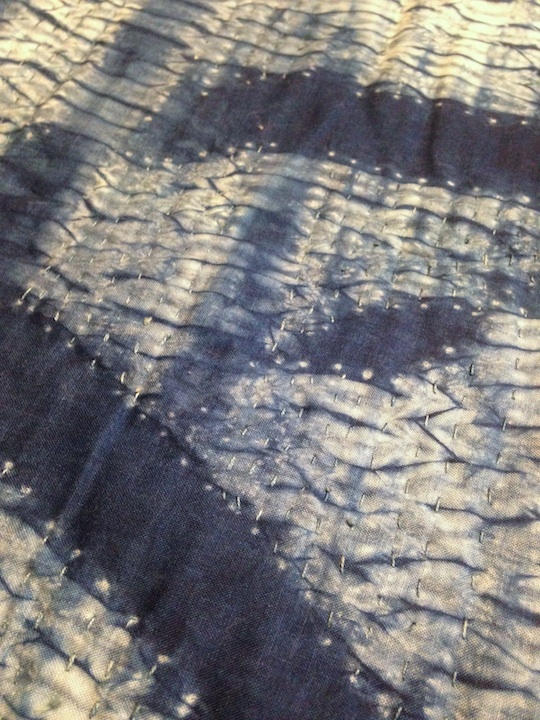 It contains the kanji 寿(Kotobuki) with shibori wrapped around the character strokes and its form is slowly emerging. 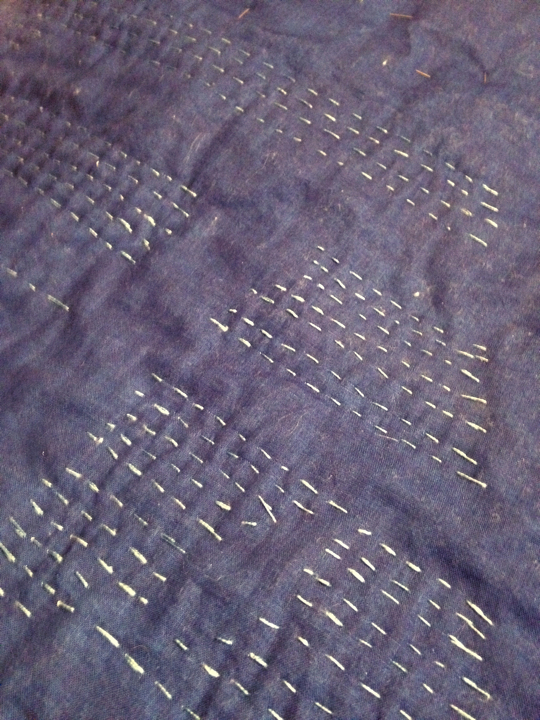 I’m enjoying the work – one stitch at a time. But, yesterday I changed the week’s work routine to dye a few scarves. 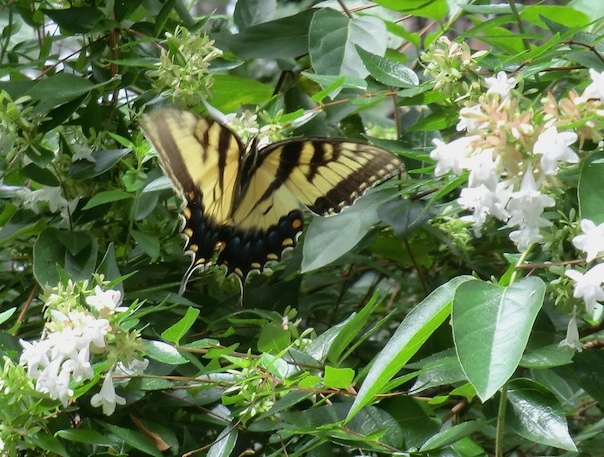 The weather was almost autumnal (except for the mosquitoes), low humidity and a breeze, good for drying things. There are always questions about fibers, how they respond to the dye, the techniques, how they read, and then again the dye and its response. The results are always unexpected and give me new things to consider. It’s never backtracking, simply practice. 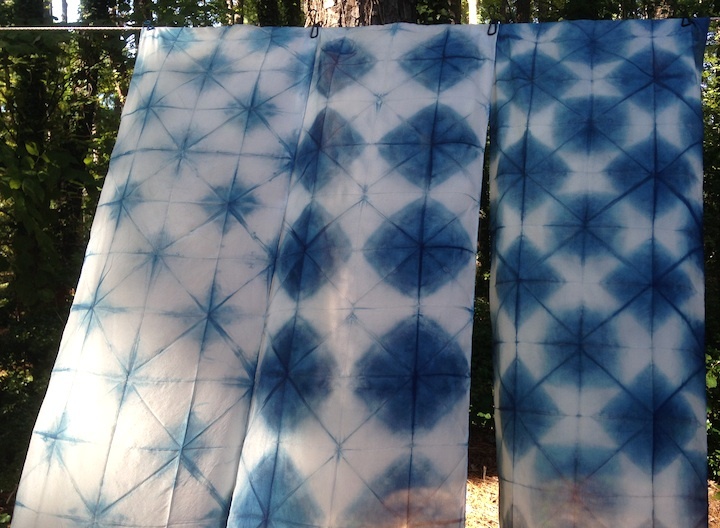 This entry was posted on August 28, 2014 at 5:20 pm and is filed under Art, Community, dyeing, Shibori, Textiles. You can follow any responses to this entry through the RSS 2.0 feed. You can leave a response, or trackback from your own site. never a dull moment with aizome! Truly! Can’t wait to dip some more – it’s been a few days.